I love this story and its illustrations so much and it makes me really sad that it isn’t huge and popular and recommended by every bookseller in the entire world. 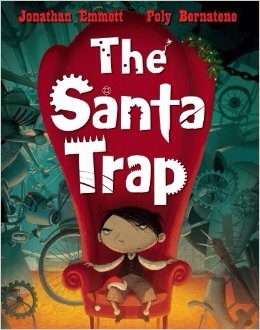 The Santa Trap is a darkly funny story about one boy’s quest to get the presents he REALLY deserves. Bradley Bartleby has a bone to pick with Santa: every year, Santa gives him a pair of socks rather than any of the presents on his large list of demands. Well, not this year. Because this year, Bradley has booby-trapped the house. This year, he’s taking his presents by force and Santa had better look out. The illustrations as Bradley’s best laid plans fall apart are just delightful. As is the punchline. If you know someone who enjoyed the Pirate Cruncher by Johnny Duddle, this is a book to pop in their Christmas Stocking as it is exactly the same kind of humour. It’s just a wonderful book. This entry was posted on December 9, 2014 by Lisa in Holiday Posts, Reviews and tagged Christmas Reads, Jonathan Emmett, Poly Bernatene, The Santa Trap.